Weeks after a teen allegedly smuggled a baby Bengal tiger into the U.S., the cub has made a new friend at the California zoo that took him in. Luis Eudoro, of California, allegedly brought the baby tiger back from Mexico after he bought it for $300, but border control spotted the animal in the backseat of his car. The cub was later taken to the San Diego Safari Park Zoo. 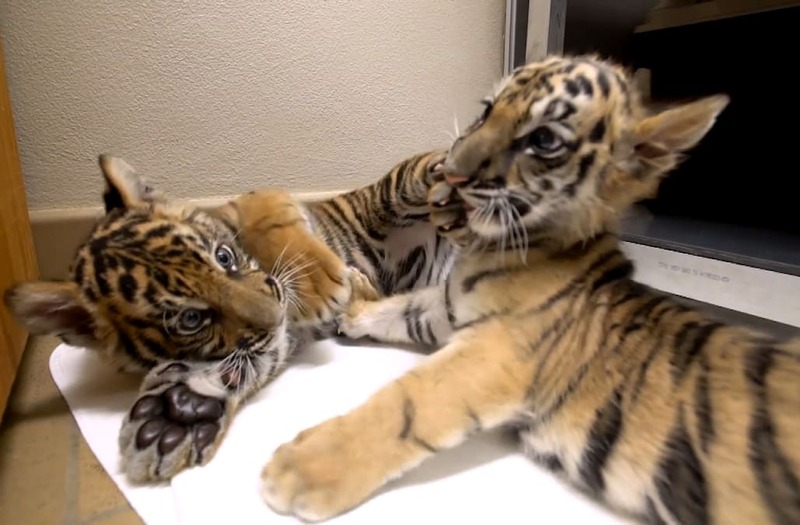 The cub, which has not yet been named yet, got a new friend after a 9-week-old Sumatran tiger from the National Zoo in Washington D.C. was abandoned by his mom. Zoo officials felt it would be a once in a lifetime chance to have the cubs paired together, so the Sumatran cub was flown to the San Diego zoo Monday. In pictures taken of the new friends, they are seen sharing hugs and kisses. Guests are now able to see the cubs in the zoo’s nursery during operating hours.